The design and implementation of security threat mitigation mechanisms in RFID systems, specially in low-cost RFID tags, are gaining great attention in both industry and academia. One main focus of research interests is the authentication and privacy techniques to prevent attacks targeting the insecure wireless channel of these systems. Cryptography is a key tool to address these threats. Nevertheless, strong hardware constraints, such as production costs, power consumption, time of response, and regulations compliance, makes the use of traditional cryptography in these systems a very challenging problem. The use of low-overhead procedures becomes the main approach to solve these challenging problems where traditional cryptography cannot fit. 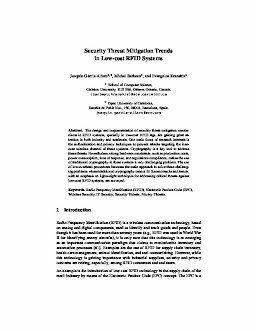 Recent results and trends, with an emphasis on lightweight techniques for addressing critical threats against low-cost RFID systems, are surveyed.